The Envy 5540 printer may print blank pages if the cartridge is out of ink or damaged, or if the print head is clogged. Check the status ink cartridge warranty before proceeding with troubleshooting. Follow the steps below to open the resolve the HP Envy 5540 printing blank pages issue. Check the estimated ink level in the ink cartridges. Replace the cartridges if the ink is low. 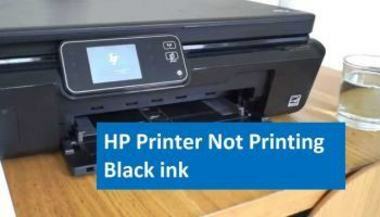 Use only genuine ink cartridges. Print a test page to verify if the issue is resolved. Clean the ink cartridges manually or from the printer’s control panel. Perform print head cleaning from your operating system if the issue remains unresolved. Carry out a deep print head cleaning if the printer still prints blank pages. Check the print settings made by you and make sure the values are set as per your print job. Call us at the toll-free number for further assistance. Make sure you have loaded genuine ink cartridge into the printer. Use of third-party ink cartridges may result in clogging of the printhead. Check the ink level of the cartridge. Tap the ink icon on the printer’s control panel to view the estimated ink level. If the ink level is low, replace the ink cartridge by following the HP Envy 5540 printing blank pages steps below. Raise the ink cartridge access door by placing your fingers on both sides of the cartridge access door. Release the empty ink cartridge by slightly pressing it down. Pull the cartridge out from its slot and send it for recycling. Remove the protective tape on the new ink cartridge. Avoid touching the cartridge contacts or ink nozzles. Insert the ink cartridge into the appropriate slot. If you are replacing the tri-color cartridges, fix the new tri-color cartridge into the right slot. Insert the black ink cartridge into the left slot. Close the access door after pushing the latches down. Press OK for all the prompts displayed on the control panel. The printer will begin aligning the ink cartridges. If the cartridges are not seated correctly properly, the ink flow will be blocked. Press the top of the cartridges until it locks into place. If the issue persists, proceed with cleaning the ink cartridges from the printer’s control panel. Tap the Setup icon on the printer’s control panel by swiping the display to the left. Tap Tools in the Settings menu and then select the Clean Cartridges option. The printer will begin cleaning the ink cartridges. Once the printer is done with the cleaning, a Print Quality Diagnostic report will be automatically printed. Examine the report and tap Yes if the print quality is not up to the mark. This will initiate a deeper cleaning. Touch No if you are satisfied with the print quality. If the HP Envy 5540 printing blank pages error persists, modify the print settings as per the type of print media loaded into the printer.